A new radar system to supply improved, real-time wave-height data at the Straits. At least $1.8 billion in available funds to be provided by Enbridge to respond to a potential oil spill in the Straits or anywhere on Line 5 in Michigan. Regular, semi-annual meetings between Enbridge and the State. Funding to install video cameras in the Straits to support new regulations from the U.S. Coast Guard prohibiting ships in the area from dropping their anchors. Immediate additional safety measures at 13 priority Line 5 water crossings, in addition to requiring actions at 68 other crossings as identified in a previous report. Enbridge staff be present at the Straits to be able to shut down the line within 15 minutes when wave heights hit 6.5 feet for at least an hour. Enbridge must continue to shut down the Straits pipeline when wave heights hit 8 feet for at least an hour. Discussion on a multi-use utility tunnel beneath the Straits. The State is proposing that Enbridge would pay for all design, construction, operation and maintenance of the tunnel for up to 99 years, subject to approvals by the Mackinac Bridge Authority. Tunnel construction is estimated to cost between $350 million to $500 million over a 7- to 10-year duration. The Agreement simply calls for initiation of discussions regarding a Straits Tunnel. This does not mean the tunnel is agreed upon or even a guarantee in the future. In fact, Enbridge’s official statement regarding the Agreement calls it merely “a commitment to explore the replacement of the Straits section of Line 5 with a tunnel under the lakebed that would contain a new pipeline.” (emphasis added) Should Enbridge and the State fail to reach a further agreement about a tunnel, Enbridge still has the ability to operate Line 5 in the Straits of Mackinac in its current form, under the 1953 Easement. This is far from a solution. Rather, the Agreement leaves Line 5 operational for an unknown amount of time into the future without requiring sufficient safeguards to prevent an oil spill. Even if a tunnel was agreed to by Enbridge and the State of Michigan, a utility tunnel only addresses the risk posed by four miles of Line 5. Risk to Michigan’s waters, public health and safety, and the economy remain for the other 543 miles of Line 5 located within Michigan. The other 543 miles of Line 5 have nearly 400 sites where it crosses a waterbody. The inland portions can pose just as great, if not greater threat, due to the basic construction, operation, and maintenance of the line. The wall thickness of the inland pipeline is significantly less. It is 0.281 inches thick versus 0.813 inches at the Straits. Along with a thinner pipeline, it operates at a higher pressure. In addition, it has a side seam, which the Straits portion of pipe does not have. This seam can be subject to stress cracking and could cause the inland pipe to be more vulnerable. The inland portion is also not subject to the same inspection frequencies. Of particular note, Line 5 will still traverse across the Upper Peninsula, along the U.S. 2 corridor, where there are a number of direct tributaries to Lake Michigan. A leak or rupture along this portion could result in an oil spill into Lakes Michigan-Huron and the Straits of Mackinac, and the same containment and recovery difficulties would exist. The Final Report Risk Analysis for the Straits Pipelines, prepared by Michigan Technological University, highlighted the risk associated with this inland portion of Line 5. The U.S. Coast Guard (USCG) personnel and emergency managers both pointed to the stretch of the pipeline along U.S. Highway 2 near Lake Michigan’s northern shore as their worst-case scenario. They cited a combination of less robust technology such as pipeline wall thickness and monitoring equipment, as well as higher vulnerability to an errant strike and potential access problems for containment and cleanup equipment, as well as difficult terrain and environment for cleanup activities. A solution that would have actually protected Michigan’s waters and Great Lakes would have been for the Agreement to call for the decommissioning of Line 5 within a designated timeframe. It is clear to all parties, even the State of Michigan, that Line 5 cannot remain in the Straits in its current form. Therefore, the only responsible course of action is for the State to initiate the process of decommissioning Line 5 while discussions continue regarding alternatives. It is worthwhile to note that reports were conducted by London Economics International (LEI), with funding from the C.S. Mott Foundation, to analyze what the impacts to Michigan would be if Line 5 were decommissioned. The conclusion from the leading experts was that Michigan has substitutes for the services provided by Line 5 which would have no noticeable impact on our economy. The Governor failed to acknowledge these reports and consider the alternatives that would provide greater protection of Michigan’s natural resources while providing Michigan’s citizens and businesses with the necessary oil and natural gas liquids. There are many other significant problems with the recent Agreement. As we pointed out with the first agreement, the current definition of “Sustained Adverse Weather Conditions” is inadequate to protect the public health, safety, and welfare and the unique ecological and natural resources of the Straits crossing in the event of a release of petroleum from Line 5. The current definition does not correlate with conditions in the Straits that would prevent or significantly impair containment and recovery of spilled oil using current emergency response capabilities in the Straits of Mackinac based upon available equipment and resources. Current equipment procured by Enbridge is only effective in waves less than 4 feet in height. In addition, there are many maritime conditions that would prevent or significantly impair the effective containment and recovery of spilled oil or exacerbate the spread of spilled oil, including wave height, wind, ice cover, and surface and subsurface currents. Likewise the Agreement measures to mitigate potential vessel anchor strike is insufficient. The agreement merely requires Enbridge to fund video cameras that will be used for enforcement of a USCG rule that prohibits vessels from anchoring in the Straits area. The cameras will in no way prevent an anchor strike from happening. Enbridge actually proposed a number of common-sense measures to improve communications and mitigate anchor strikes, such as an enhanced public awareness campaign, additional signage and physical marker buoys as well as full implementation of a vessel identification and alert system. However, none of the measures are required under the Agreement. The Agreement also incorporates a 2015 agreement regarding the transportation of heavy crude (dilbit) through the Straits pipeline. However, the 2015 agreement permits the transport of heavy crude should the pipeline be re-engineered. If Enbridge proceeds with the tunnel option, the pipeline’s current engineering configuration and/or operating parameters will be changed. This change can then allow the transport of heavy crude through the Straits of Mackinac. The Agreement provides for additional measures to be taken based upon a water crossing study. However, the water crossing study was not a thorough study and it missed key crossings. For example, they missed Saunder’s Creek, which is a tributary of the Black River. The Black River is one of the five streams in Northern Michigan where the Hungerford’s crawling water beetle has been found. This tiny aquatic beetle is one of Michigan's rarest species, designated as a critically imperiled species, G1, on The Nature Conservancy's Global Conservation Status Rank. In addition, site visits were not conducted for the water crossing study. The first thing needed would be to conduct additional analyses of crossings – looking at the installation method, date of latest hydrotest, inline inspection dates and results, and field inspections to look for upstream obstructions, evidence of channel deepening or scour, visible erosion of stream banks, etc. In addition, the Watershed Council recommended a number of other measures that should be taken with respect to pipeline water crossings in the State. Overall, the Watershed Council is highly disappointed with the Agreement. After a number of years of debate and studies, the State of Michigan had the opportunity to actually address the future of Line 5 and protect the waters and shoreline areas of Lakes Michigan and Huron, including those surrounding and adjacent to the Mackinac Straits that contain abundant natural resources that are of great ecological and economic value. But they failed to do so. Decommissioning of Line 5 needs to be initiated immediately as discussions continue regarding alternatives. Evaluation of all other Line 5 water crossings to assess measures to minimize the likelihood and/or consequences of a release at each location. ​Under the agreement, Enbridge was to conduct studies, with state oversight, that were due in June. These reports will supplement public and stakeholder input to inform a decision on the final disposition of Line 5. While the agreement includes a few positives, overall, it fails to protect the Great Lakes from the risk posed by Line 5 and discounts the voice of Michigan’s citizens. In 2015, the Governor created a Pipeline Safety Advisory Board, which includes a representative from Tip of the Watershed Council. The charge of the Board is to provide guidance and advice on the safety, upkeep and transparency of issues related to Michigan’s network of pipelines. The agreement signed on September 27th was made behind closed doors and without input or knowledge from the Advisory Board. This makes the agreement disingenuous and disconcerting. One of the most glaring problems with the agreement is its failure to address the most visible and immediate concern – the coating issues that we now know have plagued the pipeline for years. Enbridge recently inspected 48 out of 128 anchor locations along the pipeline route in the Straits and a majority of those 48 areas have coating gaps. We can only presume that a majority of the remaining 80 anchor locations that still need to be inspected will also have coating gaps. Given this knowledge, the agreement should have called for the temporary shutdown of Line 5 operations until the rest of Line 5 in the Straits can be inspected and all of the bare steel and coating issues can be fully repaired. In addition, the timing of the agreement is questionable. The State released the final version of the Line 5 Alternatives Analysis report on November 20, 2017 which began a public comment period to gather input on what the State should do regarding the future of Line 5. However, seven days later, prior to scheduled public feedback sessions, this agreement is announced. This completely discounts the public’s voice. The agreement tells the public that a pathway forward has been chosen and conveys to the public that their input doesn’t matter. While the agreement does not represent the final decision on Line 5, it does lead toward a particular alternative – replacement of Line 5 in a tunnel beneath the Straits of Mackinac. Most of the public would not agree that this is the path the State should be pursuing for the future of Line 5 and the Watershed Council agrees. 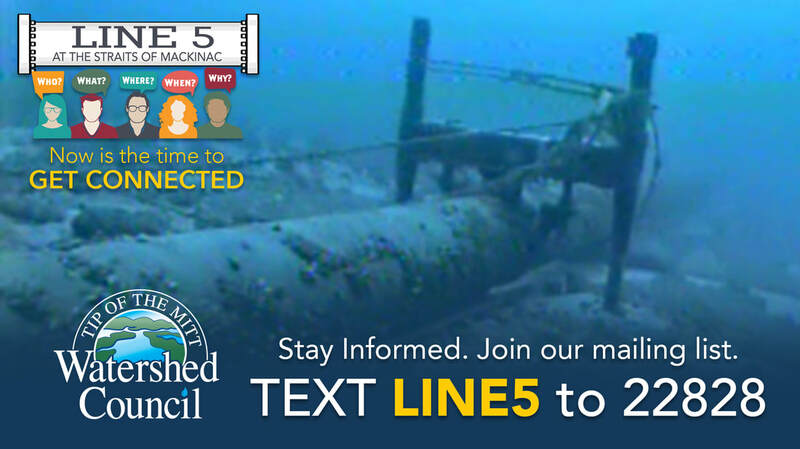 Replacement of Line 5 in the Straits, whether tunneled, installed below the lakebed using horizontal directional drilling, or trenched in secondary containment, will not eliminate the risk to the public trust waters of the Great Lakes. The inland portions of Line 5 will still remain. In particular, Line 5 will still traverse across the Upper Peninsula, along the U.S. 2 corridor, where there are a number of direct tributaries to Lake Michigan. Any leak or rupture along this portion would still result in an oil spill in Lakes Michigan-Huron and the Straits of Mackinac, and the same containment and recovery difficulties would exist. Additionally, the inland portions can pose just as great, if not greater threat, due to the basic construction, operation, and maintenance of the line. The wall thickness of the inland pipeline is significantly less. It is 0.281 inches thick versus 0.813 inches at the Straits. Along with a thinner pipeline, it operates at a higher pressure. In addition, it has a side seam, which the Straits portion of pipe does not have. This seam can be subject to stress cracking and could cause the inland pipe to be more vulnerable. The inland portion is also not subject to the same inspection frequencies. If you look at historic dent summary, you will see that there are more dent features total and features per mile inland than in the Straits. This shows the vulnerability of the inland portion of Line 5. Therefore, simply replacing the Straits portion of the pipeline ultimately fails to eliminate the risk to the Great Lakes and Michigan’s waters. Despite all of this, there are a few positives in the agreement worth noting. First, it provides a timeline and sets a goal of August 2018 for reaching a final decision on the future of Line 5. In addition, the agreement finally has the State looking beyond the 4 mile stretch of Line 5 located in the Straits of Mackinac. It calls for an evaluation of all 245 other water crossings across the State. Three years ago, the Watershed Council led the effort calling for a water crossing study to evaluate the risk of ruptures and leaks in all sections of pipeline that cross Michigan’s rivers, streams, and wetlands. While it should not have taken three years for it to come to fruition, we are pleased to see that an assessment will at long last be conducted to identify measures to minimize the risk at Line 5 water crossings.